So what happened to costs of care after that law was put in place? Citizen Watch analyzed just that using data from the Dartmouth Atlas of Health Care….Texas is blue, the nation is red, and the law went into place at the dotted line. 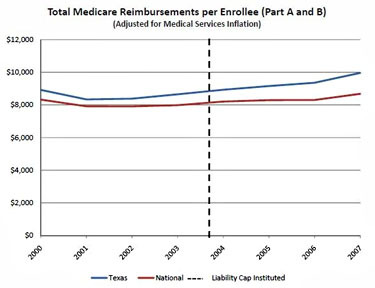 If anything, Texas’s Medicare spending seems to have gone up faster than the nation’s since 2003. Hardly a persuasive argument for tort reform = cost control. Of course, you barely even need a study to understand the extreme unlikelihood of this working. The goal is to reduce the rate of unnecessary testing that doctors perform merely due to fear of frivolous lawsuits, but frivolous lawsuits, almost by definition, are small and aren’t affected by damage caps. The only cases affected by caps are big, serious cases of malpractice, and those are both rare and complicated. They usually turn on some kind of gross negligence, and they’re demonstrably non-frivolous. Capping damages in these cases simply has no effect at all on behavior meant to deter nuisance suits and therefore no effect on the practice of defensive medicine. Of course, this is so obvious that even the Texas legislature surely understands it. However, they also understand something else: trial lawyers make their money on the big, serious cases, and if you cap damages in the big cases then you also limit the income of trial lawyers. And trial lawyers are big contributors to the Democratic Party. So capping damages in serious cases of malpractice does nothing to harm the storefront purveyors of frivolous lawsuits, but it does harm two other groups: victims of serious malpractice and the Democratic Party. That’s a shame about the victims, but hey — you can’t make an omelette without breaking a few eggs. It’s all for the greater good, my friends.